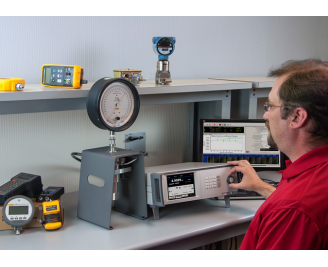 MESA MEASUREMENT STANDARDS FACILITY PROVIDES CALIBRATIONS, CERTIFICATIONS, SALES AND SERVICE FOR ALL TYPES OF CALIBRATION AND TEST INSTRUMENTS. National Insitute of Standards & Technology. N.I.S.T. so we can insure that it is operating as it is used in the field. We also know the requirements as per AGA American Gas Association for maintaining calibration equipment. We use automated asset managment software to generate our certificates for pressure and electrical. This minimizes the human factor that can cause errors. and many independent contractors and producers. This is Flukes newest pneumatic pressure controller. It will produce a precision measurement and control up to 3000 PSI. This is one of Flukes best Master Electrical Calibrator. And many other quality reference instruments to maintain the accuracy of our customers calibration equipment. Mesa Measurement uses Compass for Pressure automated calibration software with our pneumatic and hydraulic standards.